HUC-MAZELET LUQUIENS | Geringer Art, Ltd. The American printmaker, painter and art educator Huc-Mazelet Luquiens was born on June 30, 1881 in Auburndale, Massachusetts to French-speaking Swiss parents. Luquiens came from a distinguished family: his grandfather had been the chair of French Language and Literature at Yale, and his father, Frederick Bliss Luquiens (1875-1940) was a Yale professor of Spanish and French who achieved eminence for his translation of the “Song of Roland” the oldest known work of French literature. Luquiens graduated from Yale University in 1902 where he received training in art, earning both a bachelor of arts and master of fine arts degrees. After Yale, he continued his studies in Paris at the École Nationale Supérieure des Beaux-Arts where he studied with Luc-Olivier Merson and also Leon Bonnat. He then continued his studies at the Academic Julien. He established himself as a portraitist in New Haven, and later exhibited in the 1915 Panama-Pacific Exhibition. He first travelled to Hawaii in 1917 to visit his sister who had married into the Judd family. 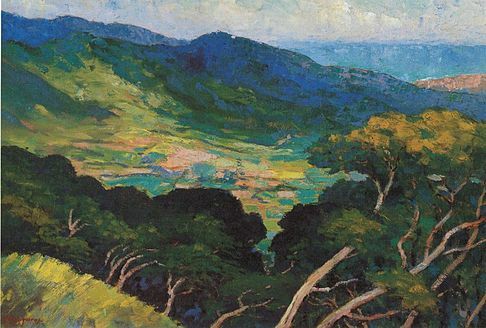 Along with society portraits, Luquiens began depicting the Hawaiian landscape. After teaching at the Punahou Shcool he became the first art teacher at the University of Hawaii, and then served as its chair from 1936 to 1945. Always active in community affairs, Luquiens co-founded the Honolulu Printmakers. Among his most desired works are his etchings and woodcuts portraying the Hawaiian landscape and its vanishing culture. Between 1918 and 1950 he created over 300 prints, bequeathing many of them to the Hawaii State Foundation on Culture and the Arts. Huc-Mazelet Luquiens died in Honolulu in 1961. Works by Luqiens can be found in the collections of The Bishop Museum (Honolulu, Hawaii), the Butler Institute of American Art (Youngstown, Ohio), the Fine Arts Museums of San Francisco, the Hawaii State Art Museum, the Honolulu Academy of Arts, the Nelson-Atkins Museum of Art (Kansas City, Missouri), the Hilo Art Museum (Hilo, Hawaii), and the Yale University Art Gallery.